Mark was born in London in 1965, moving with his family to north western Tasmania in 1968. 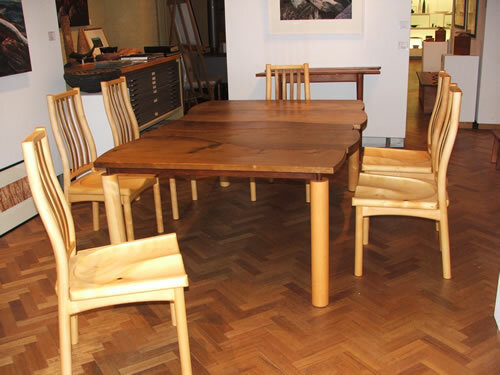 He began working with timber in 1983 and was selected as one of only four students to study a diploma of fine furniture design at the Canberra School of Art, under the late George Ingham. In 1997, he became an artist in residence at the internationally-renowned Wood Turning Center in Philadelphia, where he honed and perfected his skills. He also spent 3 months in Wales in 1998, as part of a British Council Scholarship. With many previous exhibitions held in Japan, Europe and North America, Mark is well-known internationally and his commissioned furniture can be found all over the world, with pieces in private collections across the United States, Europe and the United Kingdom. In Tasmania, he has also organized several major art prizes and associated celebratory lunches, in collaboration with the 10 Days on the Island Festival. Recent design works have involved Mark in the corporate and commercial world, with board room tables supplied to the Sydney market, a refit of a fashion outlet, a contemporary coffee shop, and a boutique jeweller's shop in Hobart. Construction of environmentally-designed ecocabins for a tourism venture at Beachside Retreat West Inlet, near Stanley, has also been undertaken, where Mark’s dining and coffee tables, steel bench tops and routed doors are all part of the natural experience. The furniture design practice and workshop is in Church Street, Stanley, an historic fishing village in north-west Tasmania, where you can see Mark at work. 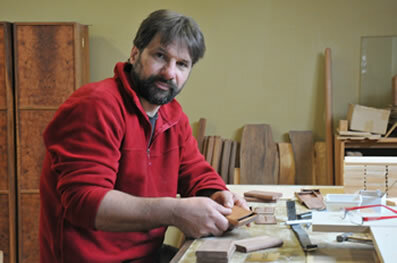 The workshop has a wide range of manufacturing capacity, from the traditional woodworking techniques through to CNC machining. Mark is available to discuss individual custom commissions for clients looking for distinctive high quality results. Contact him for an appointment.